NEW STOCK JUST ARRIVED AND IN SIMPLY STUNNING CONDITION THROUGHOUT. FINISHED IN PURE SILVER METALLIC PAINTWORK WITH A BLACK CANVAS ROOF AND FULL BLACK HEATED LEATHER INTERIOR. 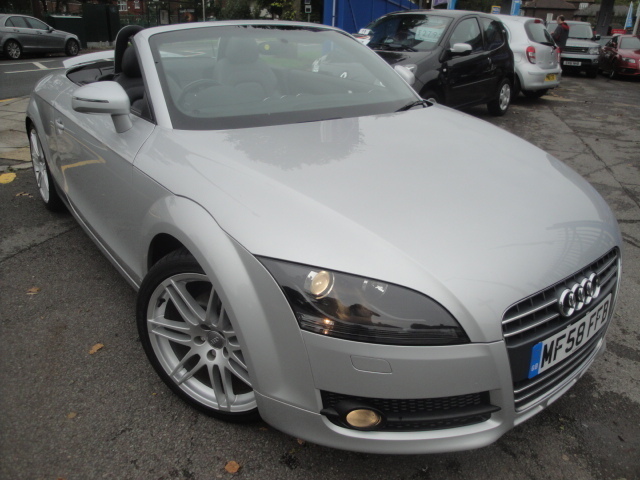 THIS TT ROADSTER ALSO BENEFITS FROM HAVINF BOSE STEREO AND 19'' SPLIT SPOKE ALLOY WHEELS WHICH REALLY SET THE CAR OFF WELL. COMES WITH FULL SERVICE HISTORY, BOOK PACK AND 2 KEYS. SERVICED AT 5225, 10608, 15906, 19707, 35646, 43101 AND 48630 MILES.